Ghent is Belgium’s best-kept secret, a cosmopolitan university city of imposing churches, top-quality museums and some of the most beautiful medieval architecture in Europe. Add to this a vigorous cultural scene, packed late-night bars, restaurants and clubs, plus stylish hotels and this is a city not to be missed. 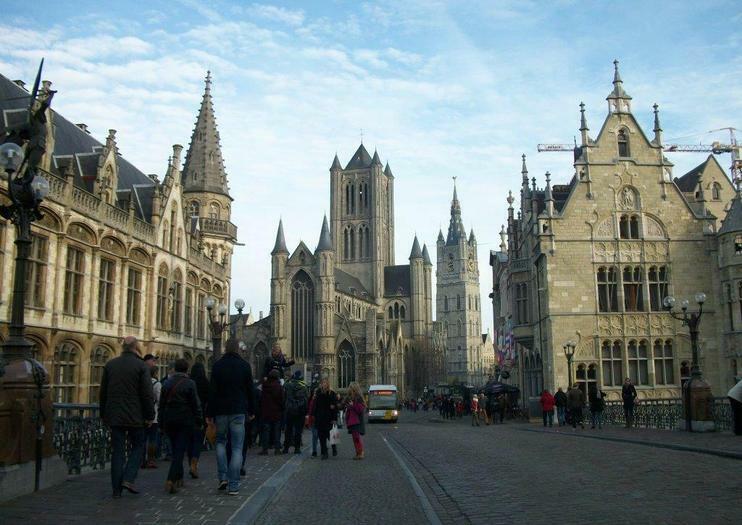 The city’s pedestrianized heart surrounds triangular Korenmarkt, which was the medieval market place, with most of the major sights – the ornate Stadhuis, St Bavo’s Cathedral, St Nicholas’ Church and the Belfry – within easy walking distance. Just northwest of Korenmarkt, the River Leie is canalized and bordered with the medieval quays of Graslei and Korenlei; it curls through Ghent on its way to join the River Schelde and a network of canals leading to the port. Close by, the austere Gravensteen Castle lies on a split in the Leie, and beyond that is Patershol, an enclave of narrow streets crammed with 17th-century artisanal cottages. Now delightfully revamped, the district is currently scene of Ghent’s hottest nightlife. Ghent’s other focal square is Vrijdagmarkt, which is huge, tree lined and surrounded by ancient guild houses – now mostly shops and restaurants – where markets spring up most weekends. In the south of the city, Citadelpark is the location of two excellent art galleries. Ghent’s tourist information office is at Sint-Veerleplein 5, in the former Fish Market, a charming red brick hall opposite Gravensteen Castle. Localgrapher is the largest network of professional photographers and videographers with more than 600 destinations around the globe! Book your private photographer and guide in Ghent to capture your picture-perfect moments while visiting amazing sites!SOLO TRAVELERSFancy an insta-perfect photoshoot from your Ghent vacation? Localgrapher has years of experience with fashion and solo travel photography! Make your memories last a lifetime and share them on social media or display them in your home to receive an avalanche of compliments. COUPLESIf you are about to propose to your loved one, honeymooning or just exploring what Ghent has to offer, put the selfie stick aside and let Localgrapher’s superb photographers take care of the photos for you both.FAMILIES & GROUPSA family trip, wedding, bachelorette party or grand get-together? Forget missing someone from pictures, we’ll capture them all!